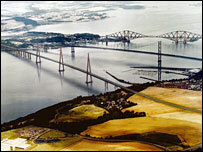 A new bridge is to be built across the Firth of Forth, just west of the existing suspension road crossing. The cable stayed-style bridge is due to open in about 2016 and will cost between £3.2bn and £4.2bn. Ruling out a tunnel, he said the chosen option would deliver the crossing in the quickest possible timescale. Mr Swinney told MSPs that the new bridge would be the "largest construction project in a generation in Scotland". "And it will be delivered through effective and comprehensive care for our natural environment." Mr Swinney said the effects of traffic and weather had taken their toll on the existing road crossing. He quoted concerns from the bridge authority that it may have to close to all vehicles by 2019. 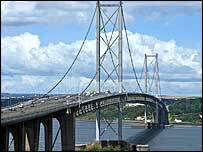 The new bridge, which will run to a point west of South Queensferry, will consist of a two-lane carriageway with hard shoulders and pedestrian and cycle access. It will also allow for the introduction of a light rail or guided bus system. The bridge will consist of three pylons or towers, with cables supporting the decks of the structure. The five-and-a-half year construction project is expected to get under way in 2011, with a competition to find a constructor due to be launched the year before. Mr Swinney said: "A cable stay bridge has lower overall risk and can be used by all types of traffic, including freight, pedestrians and cyclists and is considerably cheaper to deliver. "We are supporting commuters, supporting business and protecting the environment. This crossing will ensure that we continue to provide an effective transport network and achieve that goal." Labour's Des McNulty said they had to look more carefully at the information set out by the government, but added: "On the face of it, I think the government is doing the right thing." Quoting the SNP government's position that it would not use PFI for major projects, Tory transport spokesman Alex Johnstone said: "I and many in this chamber am becoming impatient to see the details of the proposed scheme that will come forward." Mr Swinney said information on the alternative "Scottish Futures Trust" was "imminent". The Liberal Democrats' Alison McInnes, expressed similar concerns, but added: "The fastest and more reliable construction method must be the right solution in this case." However, WWF Scotland's acting director, Dr Dan Barlow, said: "With work still under way to review the options for repairing the existing bridge, the government's decision to proceed with developing proposals for a new Forth road bridge is premature."